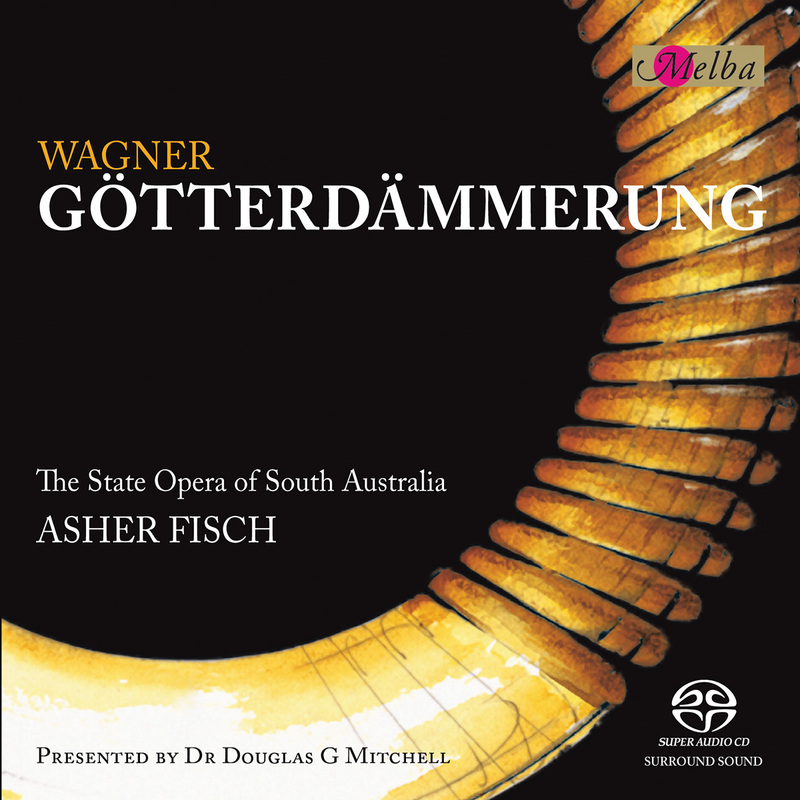 Götterdämmerung (Twilight of the Gods) is the dramatic culmination of Wagner’s epic Ring cycle from the State Opera of South Australia’s historic 2004 Australian production. The release of Melba Recordings Götterdämmerung makes musical history by completing the first ever Ring Cycle to be recorded in state-of-the-art Super Audio 5.1 surround sound. Opera magazine has described the project as “A significant moment in the history of opera” and Gramophone magazine applauded the cycle for being “sensationally recorded”, declaring it “the best-sounding cycle on the market to date, bar none”. At the end of Wagner’s opera about the swan knight Lohengrin, completed in April 1848, the hero departs from the sorrowing citizens of Antwerp leaving behind a wife, a sword, a horn and a ring. In autumn of the same year the hero of his next opera Siegfried’s Death arrived (also by boat) at a kingdom on the Rhine bringing sword and horn, with a ring and wife recently left behind him. Like Lohengrin, Siegfried’s tragic involvement in the affairs of men was to see the fall of a great man, brought about by a marriage interrupted by accusations of treachery – the very stuff of Romantic grand opera. But Siegfried’s Death was never to be finished in the old form which Wagner had originally intended. Less than four years later it had become a “music drama” about the end of the world, renamed Götterdämmerung, and extended from three to almost four acts in order to make up the final stage in the tetralogy The Nibelung’s Ring. A glorious radiant god acquires wealth and wondrous powers but falls under the sway of demonic forces. He has to become their confederate, marry their sister, and use the demonic device (the Tarnhelm) to fetch the Valkyrie (Brünnhilde) from out of the flames for his new lord. He moves fearlessly to meet his death, when pricked by the thorn of death (Hagen), the son of terror, and the stolen gold (the ring) is sunk in the Rhine. The world itself moves towards its doom in order to enter a new and higher life – the day of judgment, the great twilight of the gods when all will be slain. There were two strands of story here and, in 1848, Wagner concentrated more on the first, trying to parallel Siegfried’s death with that of Achilles (in Homer’s Iliad), and that of Baldur, son of the chief god Odin, in the old Norse tales. But as the Ring developed into a four-opera saga, it was the god Wotan’s self-denying fate and the downfall of the gods, rather than Siegfried’s adventures and death, that became Wagner’s central theme. As a result of this, by the time he came to write the music for Götterdämmerung in the 1870s – over 20 years after he first drafted the libretto – there were two interesting problems to solve. Might the character of Siegfried himself merely look like a romantic tenor hero from a style of opera that its composer had outgrown, and would the essentially old opera libretto stand up to Wagner’s new symphonic music drama with its lack of formal display arias and intricate web of motives illustrating character and psychology? Both problems were dealt with triumphantly. Already by 1852 Wagner had decided that the heroic side of Siegfried needed an entire, separate opera (a “prequel”) dedicated to his adventures as a young man. The character in Götterdämmerung would thus already be well established and could take on the tragic resonances of the heroes Achilles and Baldur when surrounded by the mundane plotting of Hagen and Gunther. And, instead of rewriting most of his 1840s grand-operatic language, Wagner realized how it could work well in the soulless and materialistic Gibichung court on the Rhine, making the most of the heroic saga world of Brünnhilde and Siegfried and their links to the gods. Brünnhilde, like all the ring’s previous wearers, is now deluded by its power and believes that it has actually become a love-token – a further twist to the love-versus-power dichotomy central to the whole Cycle. fire strikes against the very sky. Wagner had decided already by the time of Siegfried’s Death that for characterisation he would look more to the Norse sagas than to the very Christian Nibelungenlied. He wanted a more earthy Siegfried, had no use for the powerful character of Kriemhild, and would not let Brünnhilde survive at the end of the drama. He also set a precedent for his work on the Ring by following the basic outline of the story available to him from his medieval sources while deftly eliding and cementing new relationships. For example, Hagen remains the strong man, the agent of “dark” powers and Siegfried’s natural enemy. But Wagner linked him to both Gunther and Alberich by making him the “love” child of a forced affair between Alberich and Gunther’s mother Grimhilde. Wagner painted Hagen black, but not so black as to lose links with the Nibelungenlied’s image of the faithful vassal: it is arguable that, in Götterdämmerung, Hagen never lies and commits murder only to uphold the good name of his family. 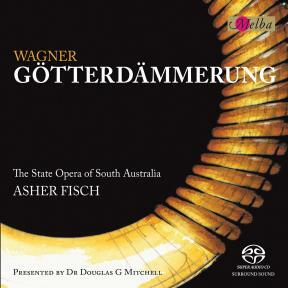 Wagner did however increase Hagen’s self-interest: in his Siegfried’s Death scene with Alberich, Hagen promises to act on behalf of his father; in Götterdämmerung he only says darkly that he will regain the ring. Similar changes of emphasis affected the characters of Gunther and Gutrune his sister. In the Nibelungenlied Gunther is a noble king who dies a true hero’s death. In Wagner, he is transmuted to an ambitious pawn in Hagen’s game, while Gutrune (a mixture of the old stories’ Gudrun, Grimhild or Kriemhild) is not at all the murderous avenger familiar from the Kriemhild of the Nibelungenlied (and Fritz Lang’s great 1920s silent movie of it). men were to lead, marked out their fates. The writer Thomas Mann praised the Ring for being like one of the great new novels of the 19th century. Wagner handled his story and characters much in the manner of a modern novelist or film scriptwriter. There was no slavish reliance on a handful of sources to be marginally adjusted, or romanticised, to make way for music – the libretto “manufacturing” that Wagner despised – but a compendium of text and dialogue sifted through the writer’s current philosophical and social concerns. There was no gap between writer and creation: the changes in Wagner’s own beliefs were immediately incorporated into the Ring, one of the reasons that the work took so long to complete and, at a more local level, one of the reasons why he tried so many different versions of the ending. Because it was both the first and the last of the Ring Cycle, the longest in creation, and the most sophisticated in musical terms, Götterdämmerung is a fascinating microcosm of Wagner’s work in opera at its most mature.